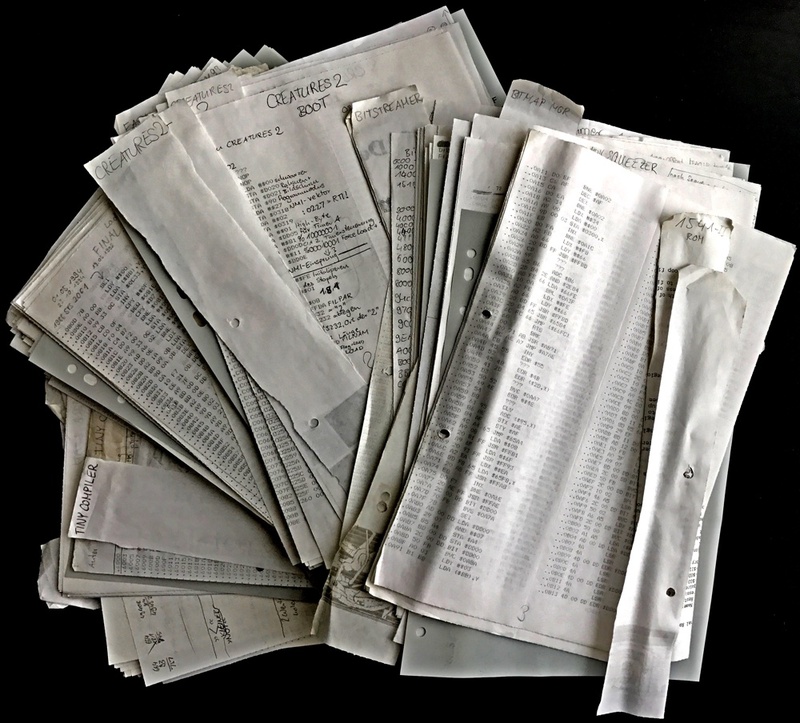 Between 1992 and 1995, I reverse engineered Commodore 64 applications by printing their disassemblies on paper and adding handwritten comments (in German). These are the PDF scans of the 62 applications, which are 552 pages total. This entry was posted in 6502, archeology on July 31, 2017 by Michael Steil. The text screen of the Commodore 64 has a resolution of 40 by 25 characters, based on the hardware text mode of the VIC-II video chip. This is a step up from the VIC-20’s 22 characters per line, but since computers in the professional segment (Commodore PET 8000 series, CP/M, MS-DOS) usually had 80 columns, several solutions – both hardware and software – exist to allow 80 columns on a C64 as well. Let’s look at how this is done in software! At the end of this article, I present a fast and full-featured open source implementation with several different character sets. First, we need to understand how 40 columns are done. The VIC-II video chip has dedicated support for a text mode. There is a 1000 (= 40 * 25) byte “Screen RAM”, each byte of which contains the character to be displayed at that location in the form of an index into the 2 KB character set, which contains 8 bytes (for 8×8 pixels) for each of the 256 characters. In addition, there is a “Color RAM”, which contains a 1000 (again 40 * 25) 4-bit values, which represents a color for each character on the screen. Putting a character onto the screen is quite trivial: Just write the index of it to offset column + 40 * line into Screen RAM, and its color to the same offset in Color RAM. An application can load its own character set, but the Commodore 64 already comes with two character sets in ROM: One with uppercase characters and lots of graphical symbols (“GRAPHICS”), and one with upper and lower case (“TEXT”). You can switch these by pressing the Commodore and the Shift key at the same time. There is no hardware support for an 80 column mode, but such a mode can be implemented in software by using bitmap mode. In bitmap mode, all 320 by 200 pixels on the screen can be freely addressed through an 8000 byte bitmap, which contains one bit for every pixel on the screen. Luckily for us, the layout of the bitmap in memory is not linear, but reminds of the encoding of text mode: The first 8 bytes in Bitmap RAM don’t describe, as you would expect, the leftmost 64 pixels on the first line. Instead, they describe the top left 8×8 block. 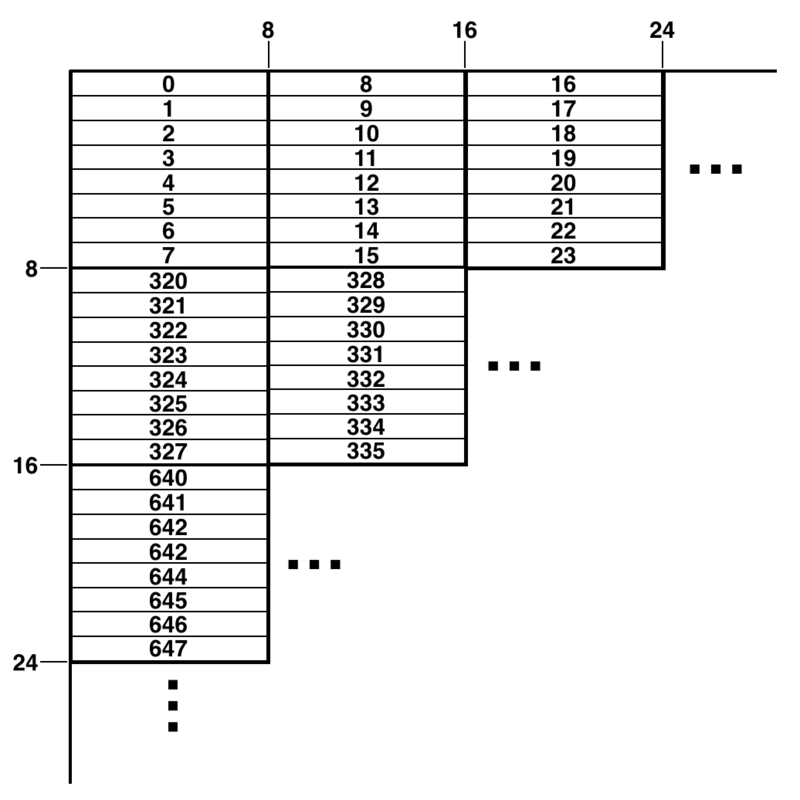 The next 8 bytes describe the 8×8 block to the right of it, and so on. This is the same layout as the character set’s: The first 8 bytes correspond to the first character, the next 8 bytes to the second character and so on. Drawing an 8×8 character onto a bitmap (aligned to the 8×8 grid) is as easy as copying 8 consecutive bytes. Every 4×8 character on the screen is either in the left half or the right half of an 8×8 block, so drawing an 4×8 character is as easy as copying the bit pattern into the 8×8 block – and shifting it 4 bits to the right for characters at odd positions. In bitmap mode, it is only possible to use two out of the 16 colors per 8×8 block, because there are only 1000 (40 * 25) entries for the color matrix. This is a problem, since we need three colors per 8×8: Two for the two characters and one for the background. We will have to compromise: Whenever a character gets drawn into an 8×8 block and the other character in the block has a different color, that other character will be changed to the same color as the new character. Scrolling on a text screen is easy: 960 bytes of memory have to be copied to move the character indexes to their new location. In bitmap mode, 7680 bytes have to be copied – 8 times more. Even with the most optimized implementation (73ms, about 3.5 frames), scrolling will be slower, and tearing artifacts are unavoidable. Creating a 4×8 character set that is both readable and looks good is not easy. There has to be a one-pixel gap between characters, so characters can effectively only be 3 pixels wide. For characters like “M” and “N”, this is a challenge. Highspeed80 and SCREEN-80 have capitals of a height of 7 pixels (more detail, but very tight vertical spacing, making it hard to read), while COLOR 80 uses only 5 pixels (more square like the original 8×8 font, but less detail). 6 pixels, as used by 80COLUMNS, seems like a good compromise. 80COLUMNS has the empty column at the left, which makes single characters in reverse mode more readable, since most characters have their stems at the left. Except for Highspeed80, the graphical symbols are very similar between the different character sets. All four character sets use the same strategy to distinguish between “M” and “N”. The “EDITOR” is the part of C64’s ROM operating system (“KERNAL”) that handles printing characters to the screen (and interpreting control characters), as well as converting on-screen contents back into a PETSCII string – yes, text input on CBM computers is done by feeding the keyboard input directly into character output, and reading back the screen contents when the user presses the return key. This way, the user can use the cursor keys to navigate to existing text anywhere on the screen (even to the output of previous commands), edit it, and have the system interpret it as input when pressing return. 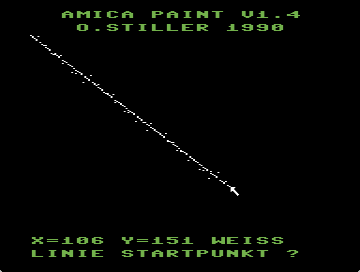 The C64’s EDITOR can only deal with 40 columns (but has a very nice feature that allows using two 40 character lines as one virtual 80 character input line), and has no idea how to draw into a bitmap, so a software 80 characters solution basically has to provide a complete reimplementation of this KERNAL component. The KERNAL provides user vectors for lots of its functionality, so both character output, and reading back characters from the screen can be hooked (vectors IBSOUT at $0326 and IBASIN at $0324). In addition to drawing characters into the bitmap, the character codes have to be cached in a 80×25 virtual Screen RAM, so the input routine can read them back. The PETSCII code contains control codes for changing the current color, moving the cursor, clearing the screen, turning reverse on and off, and switching between the “GRAPHICS” and “TEXT” character sets. The new editor has provide code to interpret these. There are two special cases though: When in quote mode (the user is typing text between quotes) or insert mode (the user has typed shift+delete), most special characters show up as inverted graphical characters instead of being interpreted. This way, control characters can be included e.g. in strings in BASIC programs. 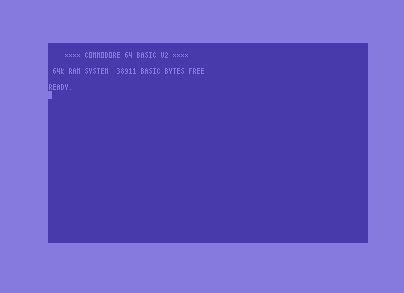 There are two functions though that cannot be intercepted through vectors: Applications (and BASIC programs) change the screen background color by writing the color’s value to $d020, since there is no KERNAL function or BASIC command for it, and the KERNAL itself switches between the two character sets (when the user presses the Commodore and the Shift key at the same time) by directly writing to $d018. The only way to intercept these is by hooking the timer interrupt vector and detecting a change in these VIC-II registers. If the background color has changed, the whole 1000 byte color matrix for bitmap mode has to be updated, and if the character set has changed, the whole screen has to be redrawn. I looked at all existing software implementations I could find and concluded that “80COLUMNS” (by an unknown author) had the best design and was the only one to implement the full feature set of the original EDITOR. I reverse-engineered it into structured, easy to read code, added Ilker Ficicilar’s fast scrolling patch as well as my own minor cleanups, fixes and optimizations. The project requies cc65 and exomizer to build. Running make will produce 80columns-compressed.prg, which is about 2.2 KB in size and can be started using LOAD/RUN. The source contains several character sets (charset.s, charset2.s etc.) from different 80 column software solutions, which can be selected by changing the reference to the filename in the Makefile. The object code resides at $c800-$cfff. The two character sets are located at $d000-$d7ff. The virtual 80×25 Screen RAM (in order to read back screen contents) is at $c000-$c7ff. The bitmap is at $e000-$ff40, and the color matrix for bitmap mode is at $d800-$dbe8. All this lies beyond the top of BASIC RAM, so BASIC continues to have 38911 bytes free. This way, the drawing code only has to mask the value instead of shifting it. In addition, parts of character drawing and all of screen scrolling are using unrolled loops for performance. Contributions to the project are very welcome. It would be especially interesting to add new character sets, both existing 4×8 fonts from other projects (including hinted TrueType fonts! ), and new ones that combine the respective strengths of the existing ones. Reducing the size of characters to 4×6 would allow a text mode resolution of 80×33 characters. Novaterm 10 has an implementation. At this resolution, logical characters don’t end at vertical 8×8 boundaries any more, making color impossible, and the drawing routine a little slower. It would be interesting to add an 80×33 mode as a compile time option to “80columns”. This entry was posted in 6502, archeology on July 10, 2017 by Michael Steil. Many reverse-engineered versions of “KERNAL”, the C64’s ROM operating system exist, and some of them even in a form that can be built into the original binary. But how about building the original C64 KERNAL source with the original tools? The Commodore engineer Dennis Jarvis rescued many disks with Commodore source, which he gave to Steve Gray for preservation. One of these disks, c64kernal.d64, contains the complete source of the original KERNAL version (901227-01), including all build tools. Let’s build it! First, we need a Commodore PET. Any PET will do, as long as it has enough RAM. 32 KB should be fine. For a disk drive, a 2040 or 4040 is recommended if you want to create the cross-reference database (more RAM needed for many open files), otherwise a 2031 will do just fine. The VICE emulator will allow you to configure such a system. The assembler will now do its work and create the file “KERNAL.HEX” on disk. This will take about 16 minutes, so you probably want to switch your emulator into “Warp Mode”. When it is done, quit the emulator to make sure the contents of the disk image are flushed. This command makes sure to fill the gaps with a value of 0xAA like the original KERNAL ROM. Also note that $FF80, the KERNAL version byte is $AA – the first version of KERNAL did not yet use this location for the version byte, so the effective version byte is the fill byte. An ASCII/LF version of the source code is available at https://github.com/mist64/cbmsrc. This entry was posted in 6502, archeology on June 13, 2017 by Michael Steil. This is the video recording of “The Ultimate Game Boy Talk” at 33C3. I will post the slides in Apple Keynote format later. This entry was posted in archeology, tricks, Uncategorized on January 6, 2017 by Michael Steil.